Hello folks, long time no see! There haven’t been a lot of news concerning B’z lately. They wrapped up their C’mon tour around christmas and then went on break. But for how long? 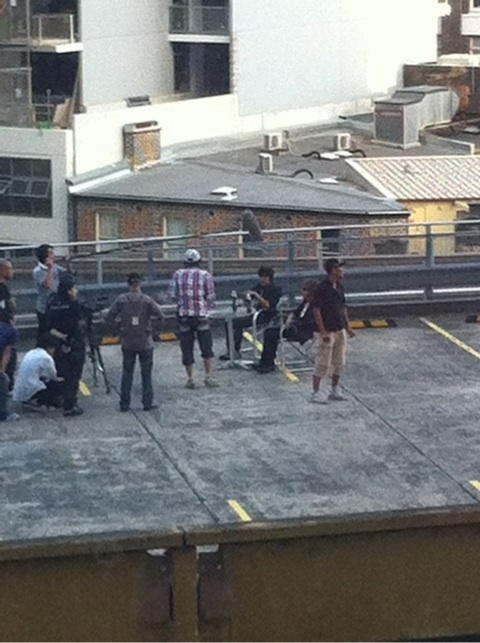 Apparently not for too long as we got word from Sydney that B’z is currently shooting a new Pepsi NEX TV commercial. The first shot that was tweeted by user @greenapple21 which showed a bunch of people on top of a parking garage. She claimed it was B’z shooting a new promo video. However, the picture was taken too far away to confirm. Today, another picture has surfaced, which clearly show Tak and Koshi sitting at a table – with apparently two Pepsi Nex bottles on the table. Looks like B’z has got a long running advertisement contract with Pepsi now? Sounds interesting… So is it a new music video they’re shooting? Or a new music video AND a commercial for pepsi nex? Or just the commercial? As B’z is currently filming, it will be a while before news get out. We suspect that news should hit the official channels by the beginning of February. Would be nice for them to stick around for a gig or two too. I’d like to hear about that! I was beginnign to think B’z were scared of Australia. Yes, I can confirm it is B’z, and it was only for a Pepsi Nex commercial.. no music video!